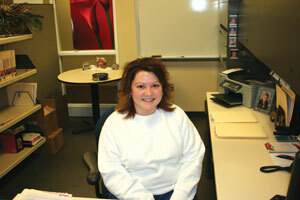 The College of Eastern Utah academic records coordinator, Cirie Noyes has been working from April 6 this year. A high school graduate and plans to finish her Associate of Science in the near future. Her job description for academic records coordinator includes help with graduation students bring their applications to her and she evaluate their records to make sure all requirements have been fulfilled; such as making sure they have all their credits and a high enough G.P.A.. She orders all diplomas and mails them after the degree is posted. She also sends out rejection letters, holding off diploma letters and missing requirement letters. She also has to register and keep a list for all concurrent enrollment students taking classes at CEU. These are student from high schools across the state taking classes through CEU’s ED-NET. She helps students who come in the registrar’s office to register or request transcripts, and answer questions. She likes to help students. Her job is never boring and that keeps her in constant motion. “There are many different personalities on campus and it is interesting to learn about each person who I meet,” she said. Noyes was born in Salt Lake City and lived there 17 years. She spent eight years in Wyoming before moving back to Utah with her family. Before being employed at CEU, Noyes was at customer service representative for DBT America for about 4 years. She has a family, husband Seth and one daughter named Madison who is 15 months old. She likes to bow hunt deer or elk, camping and fishing. “Spending time with my family is my favorite pastime though, but also likes bowling, shopping, movies, and having an occasional barbeque with friends,” she added. Noyes believes that she has an upbeat personality and likes to make others laugh and enjoy being happy.